While New Yorkers anxiously await Governor Andrew Cuomo’s decision on whether to lift the state’s de facto moratorium on high-volume slick-water horizontal hydraulic fracturing, or “fracking,” Woodstock, the iconic counter-culture capital of the world, has become the first municipality to call for legislation to make fracking a Class C felony. Woodstock’s action is just one small town’s response to a rapidly escalating global war over fracking. To both sides in this war—environmentalists and citizens who oppose fracking on the one side and the gas industry and its supporters on the other—the upcoming ruling to allow or ban fracking in New York is being viewed as (you should pardon the expression) a watershed event. Decisions made in Albany and in towns like Woodstock will likely determine whether fracking goes full steam ahead everywhere, or whether its momentum can be slowed or even stopped. New York, after all, has a rich history of environmental activism and democratic movements, and anti-fracking activism has spread like wildfire over the last couple of years. New York is also home to abundant supplies of clean freshwater, an essential resource that is in crisis globally and that could be endangered by the practice. On January 15, the Woodstock Town Board unanimously passed a resolution to petition New York State to introduce New York Public Law #1—which would impose stiff penalties for fracking and related activities. Before taking this step, the Woodstock Town Board took two others: banning fracking within its borders and outlawing the use of frackwaste fluid, some of which is known as “brine” (because of its heavy salt content), on its roads. This material is used as a de-icing agent in the winter and for dust control on dirt roads in the summer. Despite the fact that brine from oil and gas wells (whether fracked or not) is laden with heavy metals, toxic chemicals, and radioactivity, since 2008 the Department of Environmental Conservation has granted approval for it to be spread on roads in the western part of the state. New York Public Law #1 was conceived and drafted in May 2011 by the Sovereign People’s Action Network (SPAN) and FrackBusters NY—two citizen anti-fracking groups spearheaded by the late Richard Grossman, a legal historian, democracy activist, and founder of a movement to ban corporate personhood and strip corporations of their special legal privileges. Fracking is used to extract “unconventional” sources of natural gas or oil, like those found in shale formations. Unlike the large pools of gas that make up “conventional” sources, the gas in shale is typically found in separate tiny bubbles throughout the rock formation. In order to get it, drillers create a “permeable reservoir” by shattering the rock formation that contains the gas. This involves drilling a deep well straight down into the shale, then turning the well at roughly 90 degrees so that it runs horizontally another 10,000 feet or so. The well is fracked when a mixture of water, chemicals, and sand is pumped in at explosive pressure to force open cracks in the rock, enabling the gas to flow back up to the wellhead. Since these wells travel under aquifers, lakes, rivers, and streams, much concern has been raised about the potential to contaminate groundwater and other freshwater supplies. Fracking also requires a massive industrial operation, which creates significant air pollution, noise, and truck traffic. Large amounts of various toxic compounds, plus nitrous oxide, a key component of ozone, spew from diesel generators, drill rigs, trucks, condensate tanks, and other equipment, as well as the flaring of wells. In communities across the country where fracking has been underway for more than a decade, the process has left a trail of poisoned people, serious water pollution, including radioactive contamination of drinking water supplies, and potential threats to the value of people’s homes and land in drilling areas. The gas industry has denied that its actions are responsible for these problems. Meanwhile, serious questions have been raised about the integrity and economic viability of the entire enterprise. Officials within the United States Energy Information Administration, a division of the Energy Department, have suggested that estimates of gas reserves may have been purposely inflated, a concern graphically illustrated in hundreds of industry emails and internal documents—some of them dripping with contempt. On another environmental front, evidence is mounting that a vast expansion of shale gas extraction will dramatically increase global warming. That’s because the emissions of methane—a much more potent greenhouse gas than carbon dioxide—leaking out of the ground in drilling fields are much greater than previously known. Considering that fracking is becoming a global phenomenon, the methane leakage could be a significant new source of greenhouse gas emissions. – owning, possessing or transporting fracking paraphernalia anywhere in the state. The law also goes after corporations—and their boards and top management—found to violate it. New York corporations would have their corporate charter revoked, while those chartered elsewhere would have their authority to do business in the state rescinded. Such corporations could also have any assets they had in New York seized to be sold at auction, with the proceeds going to the state treasury. Nor does Public Law #1 exclude government personnel. It would also make any person working for any level of government in New York, whether as an employee or as an elected or appointed official, liable not only for compensatory and punitive damages, but also legal expenses if that person was found in violation. 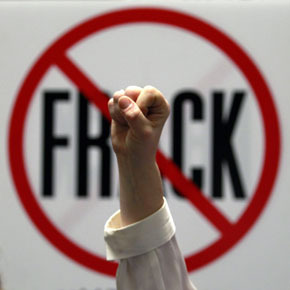 “The oil and gas mining laws of New York, as presently written, disempower citizens and communities while treating corporate fracking and fracking-related activities as legal, despite the extreme and irreversible harm this industrial process causes,” FrackBusters NY said in a statement from November 2011, when the group first unveiled the draft law. The law is intended to move the debate over fracking out of the regulatory arena, whose often glacially paced and always expensive procedures are designed only to mitigate rather than prevent harm. Instead, the law would require officials to stop the damage before it occurs. Anti-drilling sentiment is rising in New York. Currently, 43 municipalities have enacted bans, 110 have passed moratoriums, and there are movements for either outright bans or moratoria in another 91 municipalities. Not everyone is opposed to fracking, however. Like many areas in the country, the upstate economy is struggling with high rates of poverty and unemployment, issues that loom large for many people living in areas above the shale. Forty-four municipalities have passed resolutions supporting fracking, though opponents in some of those communities are trying to repeal pro-fracking resolutions and enact either a ban or moratorium. The public’s concern about shale gas extraction is much more nuanced than the common but crude “jobs versus environment” framing. According to a survey of 600 residents in upstate New York by Cornell University’s Survey Research Unit in January 2011, 46 percent said the need for jobs and economic issues was the most important concern facing their community. And 70 percent of those living in counties with urban area populations of between 10,000 and 50,000 (“micropolitan” counties) said creating local jobs was the most important goal of their local government, while 59 percent of respondents in more sparsely populated areas agreed. At the same time, environmental preservation also scored high among upstaters. In response to the question, “Given the current economic challenges facing New York State, do you believe state and local governments should be committed to protecting long-term environmental values?”, 90 percent said yes. When specifically asked about natural gas drilling and whether the risks to water quality outweighed the benefits of the revenues, or vice versa, 65 percent said the risks outweigh the benefits, 24 percent said the revenues were more important, and 11 percent said they didn’t’ know enough about gas drilling to answer. Anti-fracking groups delivered 204,000 letters on the New York Department of Environmental Conservation’s proposed regulations on January 11, 2013, the last day of a 30-day public comment period that included the Christmas holidays. The DEC took most of 2012 to read the 66,000 comments generated during an earlier public comment period. Yet the agency appears to be pushing hard to meet a February 27, 2013 deadline to approve the proposed regulations that would pave the way for the issuing of drilling permits. If the fracking regulations are not finalized by that date, the proposed ruleswould lapse, in which case the entire process would start from scratch, probably delaying any decision to allow fracking in the state for years. Governor Cuomo and the DEC have come under intense criticism for rushing the process. The most recent comment period under the state’s environmental review—quite possibly the last—asked for public input on regulations the agency put out before its environmental review was finished. The DEC’s behavior in its environmental review of fracking seems to bear out the group’s allegation. Under existing state law, DEC must publish its environmental review, a document known as the Supplemental Generic Environmental Impact Statement, or SGEIS, at least ten days before it releases its final decision. The SGEIS will contain the reasoning behind the DEC’s decisions on fracking as well as whether or not it will be permitted in New York. If the state is to meet its February 27 deadline to finalize its regulations and lift the de facto moratorium on fracking, the SGEIS would have to be published by February 13. But whether Cuomo approves fracking or not, this high-stakes fight will undoubtedly continue. To the deep-pocketed and politically powerful fossil fuel industry—which has run out of large, easily exploited reservoirs of fossil fuels—fracking is the only way to get at much of the vast supplies of what is left. Global warming or not, the fossil fuel sector is aggressively securing as much of those sources as they can throughout the world. To those concerned about the immediate harm to their health, the environment, and their communities, as well as the continued existence of our species and other life forms we share the planet with, stopping fracking is a question of life and death. If Cuomo does approve fracking in New York, thousands have pledged to continue the resistance with acts of civil disobedience. Can ordinary citizens prevail, Occupy Style, when the money piles are high, and the stakes even higher? Stay tuned.